Time flies way too fast. Just yesterday I was pregnant and now I am accompanying my daughter on field trips. Her first expedition was to a farm to visit animals and pick strawberries. 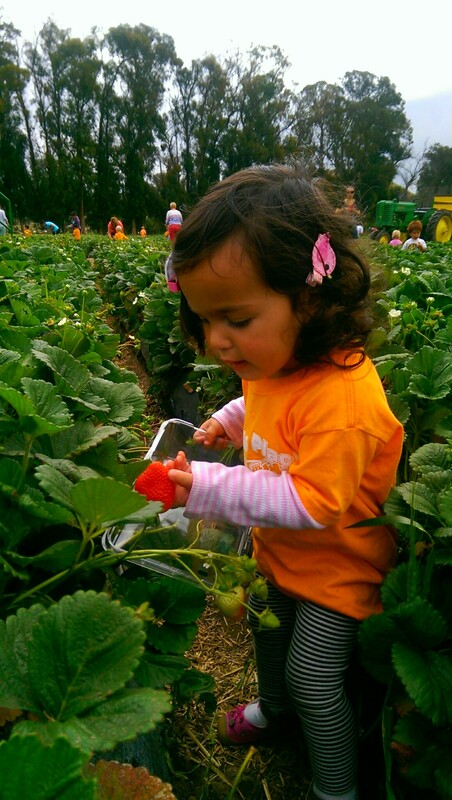 Every morning we go to the strawberry patch in our front yard and pick strawberries for her snack so I knew she would be an expert strawberry picker. She filled her container, ate them all, and then filled her container again. She knows what she is doing. But between these strawberries and the ones we grow at home we were swimming in them. 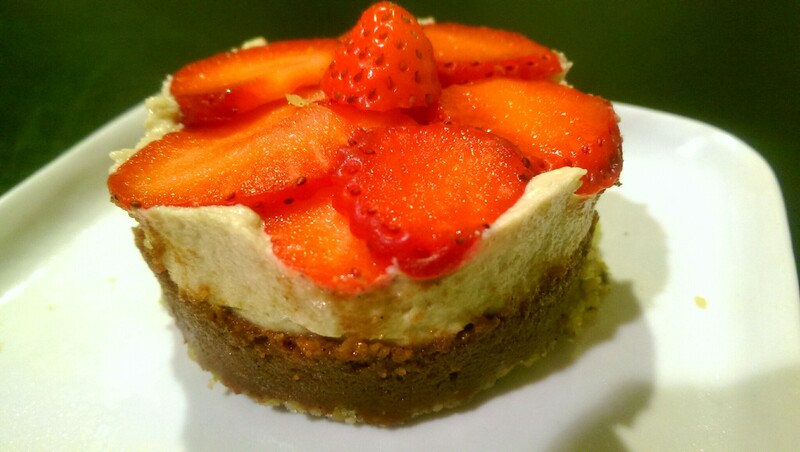 Strawberries are great for sweet or savory dishes. They are excellent with some balsamic, goat cheese, mozz and arugula on top of a pizza. Or with some spinach, toasted pine nuts and feta in a salad. But the combination of chocolate and strawberries…my oh my. My favorite part about making brownies is eating the batter before it is cooked. 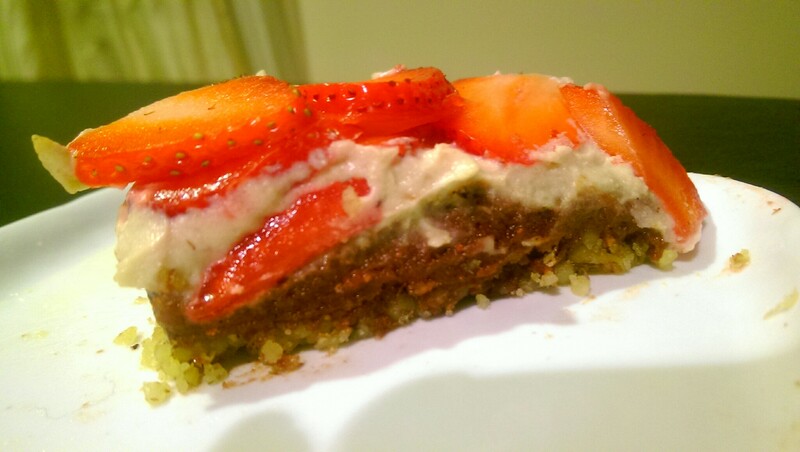 I wanted to create a firm and healthy “brownie batter” cake to pair with the strawberries. 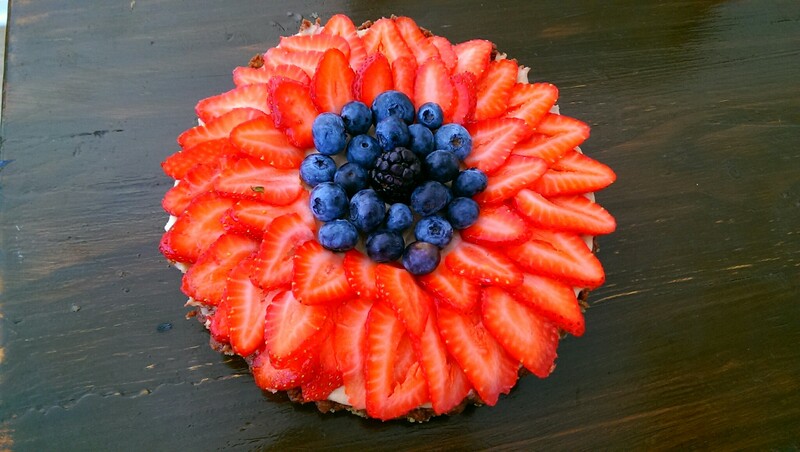 Nut based cakes are a great substitute for oats and flour, but the key is to get a rich flavor without feeling too heavy. Like many nuts, macadamia are full of good fats and vitamins and minerals, but they are sweeter and smoother than most other nuts. That combined with a bit of coconut oil and dates provided the right amount of flavor, sweetness and fat to the nut based brownie batter. I use cocoa powder for the chocolate, but to enhance the richness, I wanted to add more chocolate and “butter”. Typically I like to use bittersweet Valrhona chocolate shaved into pieces. Chocolate is a precious food – a mood enhancer, a superfood and a stimulant at the very least. It is best to eat and cook with bittersweet or dark chocolate as there is less sugar and no dairy. I get chunks of Valrhona, one of the best chocolates, from my local cooking supply store, but like many chocolates and other packaged foods, there are often extra ingredients like emulsifiers, which may not be horrible, but just are not whole foods. 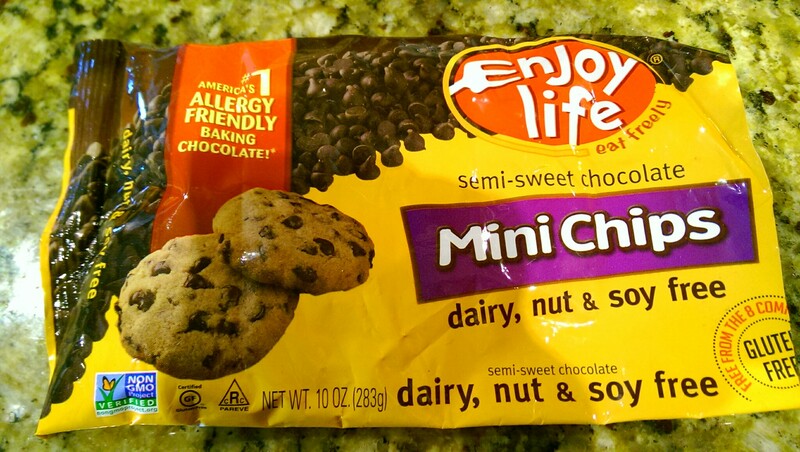 I happened upon chocolate chips from Enjoy Life that are dairy and soy free with only three ingredients (chocolate, cocoa butter, and cane sugar). If you don’t want to use chocolate in the form of chips, you can add additional cocoa powder and coconut oil. Adjust sweetness with extra dates. The extra chocolate gives it the brownie-like flavor and richness. I had to stop myself from eating the entire bowl. No dairy, no egg, no flour – I was happy to give my daughter the bowl to lick. 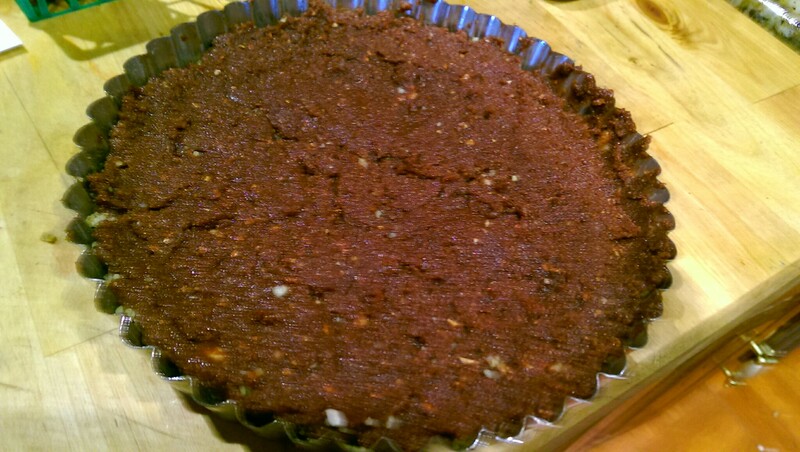 The point of this crust was mostly to prevent the brownie from sticking to the plate. However, as I pushed the brownie into the walnut, the brownie wanted to stick to my fingers and make a mess of the crust. I coated my fingers and the spatula in coconut oil to keep it from sticking as I pressed down. 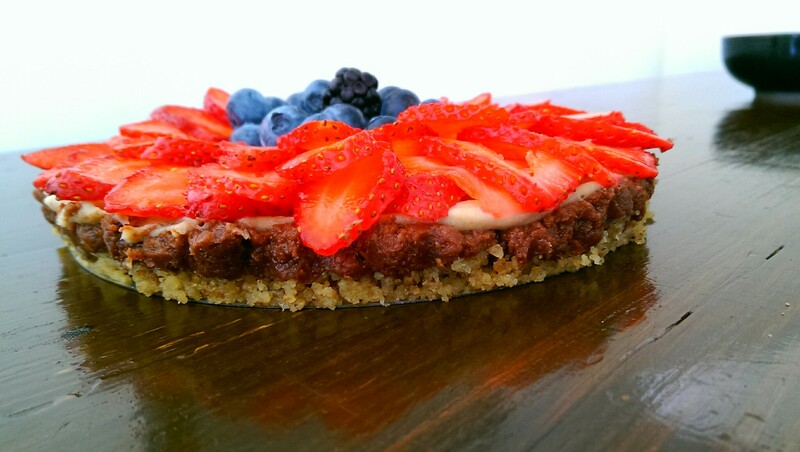 To frost the cake-like tart, I made a cashew cream flavored with strawberries and lemon. 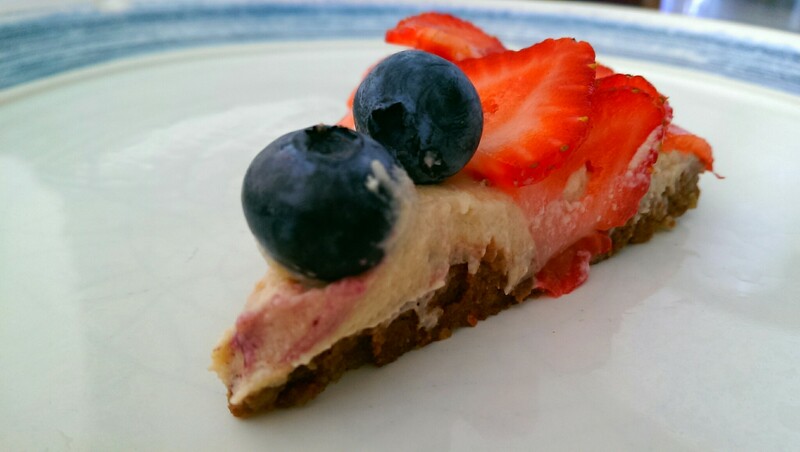 A lemon cashew “frosting” would have been fine on its own but I had the extra strawberries, so why not use them. Especially as decoration. 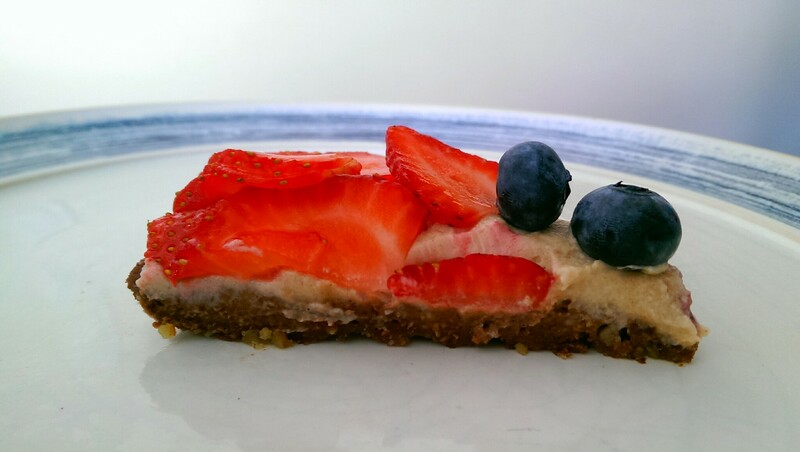 Most of my cashew cream nut cakes are frozen or refrigerated and served cold. This one held up at room temp for hours. But for nutritional content, I recommend keep it cold for as long as possible and eating it within a couple of days. 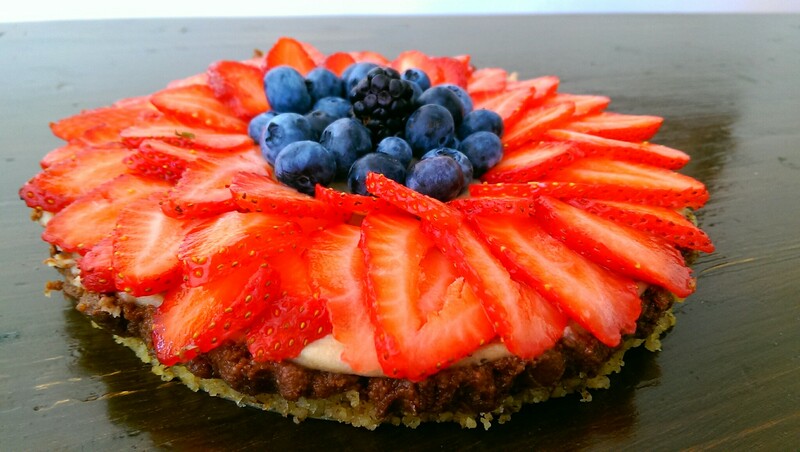 I made these into individual cakes using round food molds and into a large cake using a tart pan. Either way, the result was the same – an empty plate! 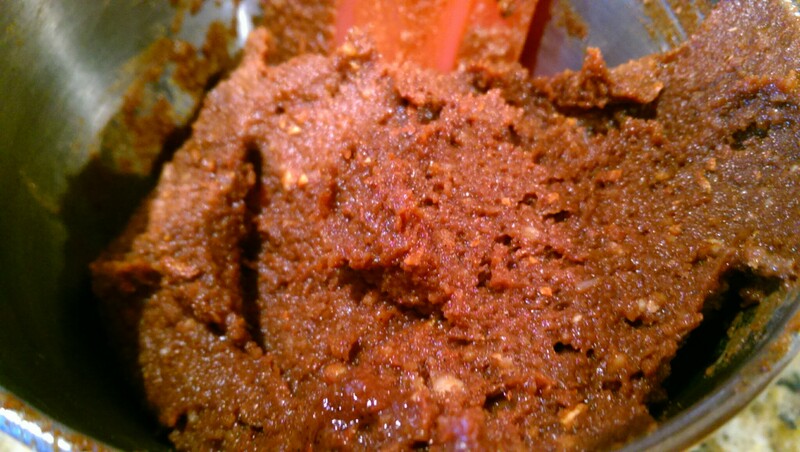 Pulse 1 cup of walnuts in a food processor until chopped into a grainy wet sand like texture. 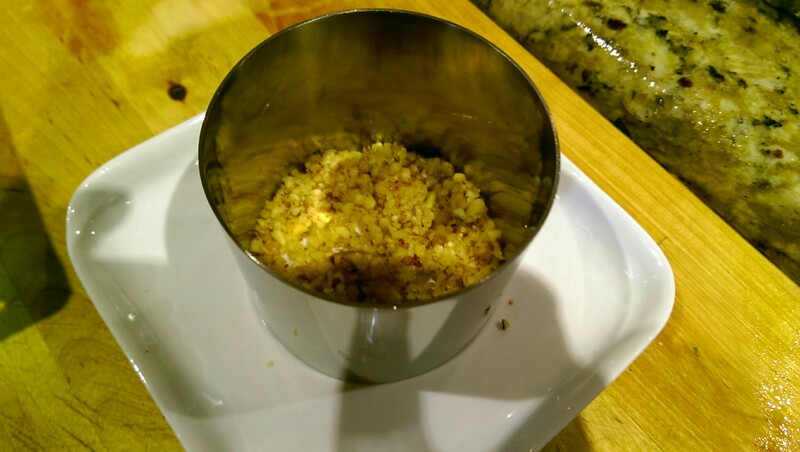 Add almonds and macadamia nuts to a food processor and pulse until chopped and blended. Add in almond meal, salt and cacao powder and mix until combined. Add in dates, coconut oil, and vanilla and combine until smooth. Add in chocolate and blend until fully combined. Refrigerate until ready to use or eat. Place cashews, dates and water into a food processor and blend until creamy and completely smooth. Add lemon juice, lemon zest, strawberries and salt and blend until combined. Refrigerate until ready to use. 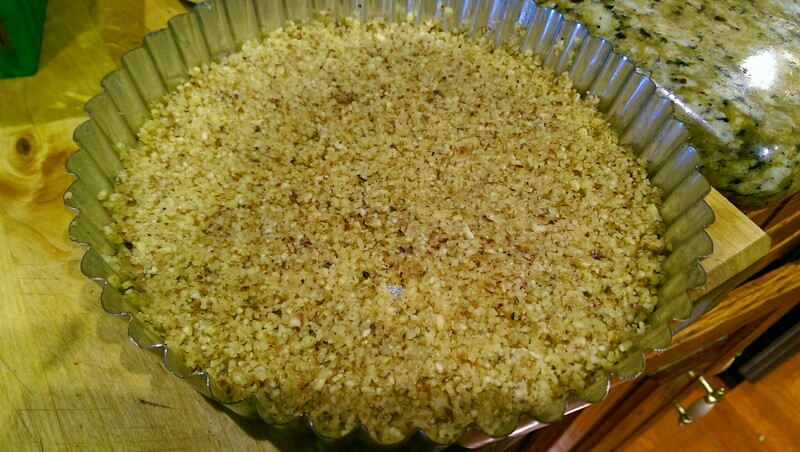 Grease the bottom and sides of the tart pan, ring molds or dish with coconut oil. spread a very thin layer of crushed walnut on the bottom. 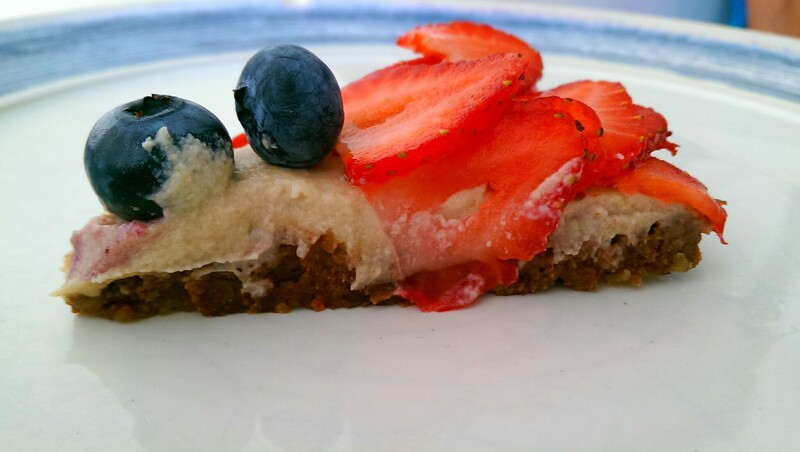 Place raw brownie on top and press down until evenly distributed and flat. 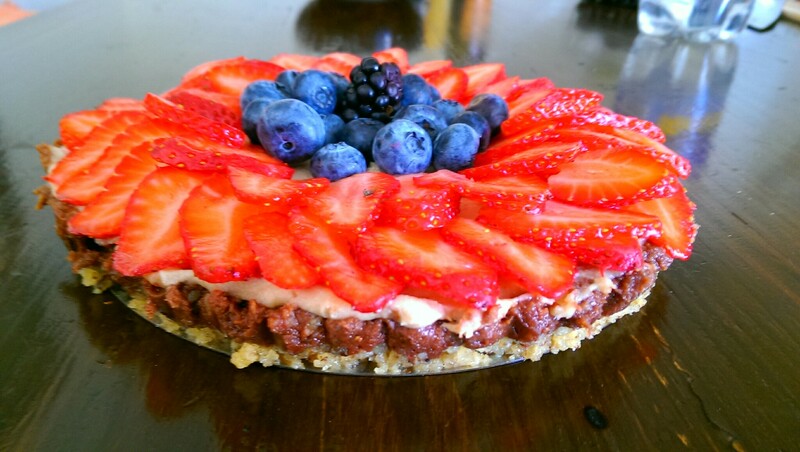 Spread cashew cream on top and garnish with strawberries, other berries and fruit. Serve room temperature or cold.